All dentists, including your general dentist, receive basic training in endodontic treatment in dental school. General dentists often refer patients needing endodontic treatment to endodontists. At IGDP Limited we will refer any compromised cases to Rory Mac Sweeney, who has a special interest in endodontics. He uses a specially designed dental microscope to perform the treatment with great success. 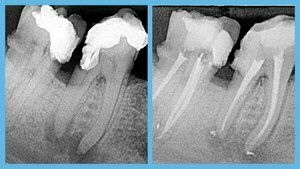 The dentist/endodontist removes the inflamed or infected pulp, carefully cleans and shapes the inside of the canal, a channel inside the root, then fills and seals the space. Afterwards your dentist will place a crown or other restoration on the tooth to protect and restore it to full function. After restoration, the tooth continues to function like any other tooth. Many endodontic procedures are performed to relieve the pain of toothaches caused by pulp inflammation or infection. With modern techniques and anaesthetics, most patients report that they are comfortable during the procedure. For the first few days after treatment, your tooth may feel sensitive, especially if there was pain or infection before the procedure. This discomfort can be relieved with over-the-counter or prescription medications. Follow your dentist’s/endodontist’s instructions carefully. Your tooth may continue to feel slightly different from your other teeth for some time after your endodontic treatment is completed. However, if you have severe pain or pressure or pain that lasts more than a few days, call your dentist/endodontist. The cost varies depending on how complex the problem is and which tooth is affected. Molars are more difficult to treat and the fee is usually more. Generally, endodontic treatment and restoration of the natural tooth are less expensive than the alternative of having the tooth extracted. An extracted tooth must be replaced with a bridge or implant to restore chewing function and prevent adjacent teeth from shifting. These procedures tend to cost more than endodontic treatment and appropriate restoration. With root canal treatment you save your natural teeth and money. New trauma, deep decay, or a loose, cracked or broken filling can cause new infection in your tooth. In some cases, the dentist/endodontist may discover additional very narrow or curved canals that could not be treated during the initial procedure. How long will the endodontic treatment last? Along term failure rate is. This is because it is very difficult to follow up a sample group of patients for periods of 20-30 years. Any research of this type would be useless unless at least 50% of the patients could be reviewed at the end of the study. In today’s increasingly mobile society, this is a challenge. Anecdotally, it would appear that in the long term failure of technically good root canal treatments does not seem to occur in well maintained mouths. These teeth are more likely to be lost because they fracture or of gum disease, than because the root treatment fails. The British Endodontic Society reports that past and current studies indicate the success rate to be 83%. What are some of the other possible complications of endodontic treatment? It might happen that a fine instrument used to do the treatment separates or fractures and have to be left inside the tooth, in which case you will be informed about it. Your dentist/endodontist will then discuss with you what can be done about it. You might experience pain after the root canal treatment, which can have several causes. It is also possible that a root can be perforated or that the root canal filling material is placed beyond the boundaries of a root. All the case illustrated here have been treated by Rory Mac Sweeney at IGDP.